Had a bit of a restless evening so I spent some time working on the assassins last night and finished them off this morning while doing some laundry. 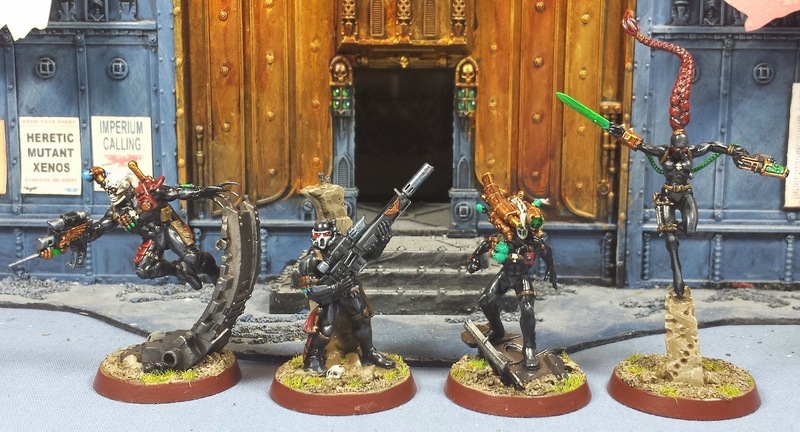 Thoroughly enjoyed working with these models, though in retrospect I should have left the Eversor and Vindicare separate from their terrain features for ease of painting and assembled them afterwards. 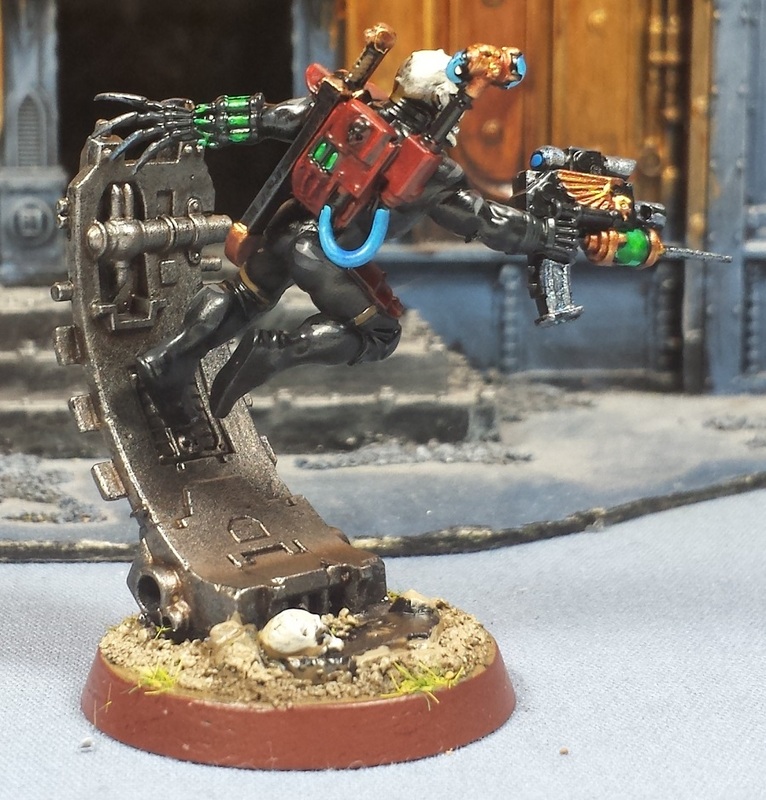 The Eversor is definitely the stand-out model of the set for me, the sense of motion is fantastic. 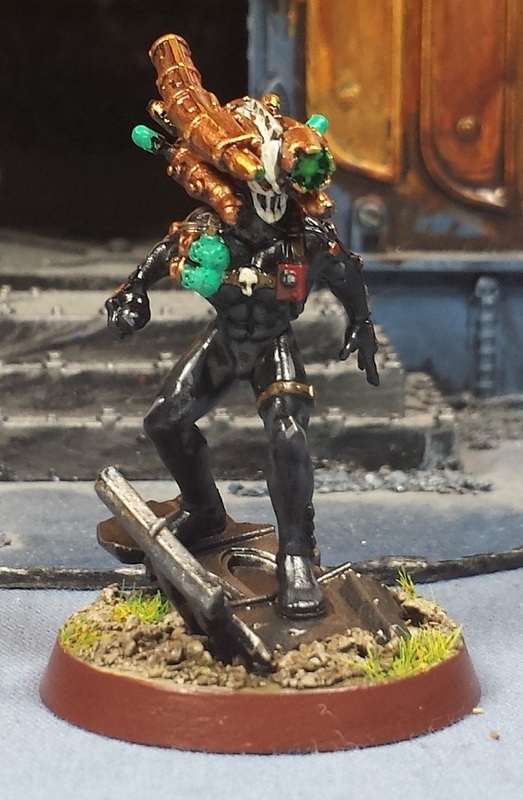 The Culexis has always been my favorite of the assassins, and the new model definitely doesn't disappoint. I've always loved the somewhat Giger-esque form of his helmet! 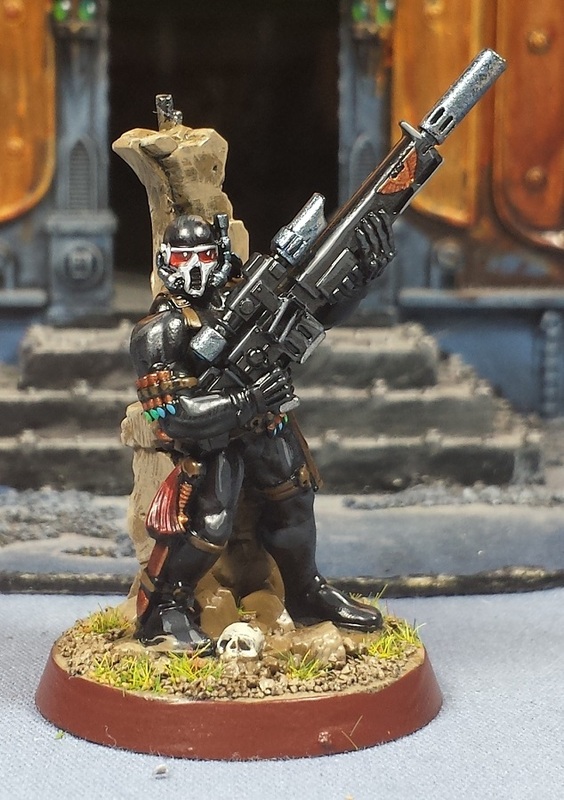 The assassin that's always been a reliable death-dealer for me in the past, the new Vindicare sculpt is probably the least interesting of of the four, but still a solid model. The Callidus is a fantastic sculpt as well, albeit somewhat difficult to photograph - it looks a little ungainly in the pic, but it really has a lithe athleticism to it. Nice job! Now I can't wait till my set comes in. Really nice job. 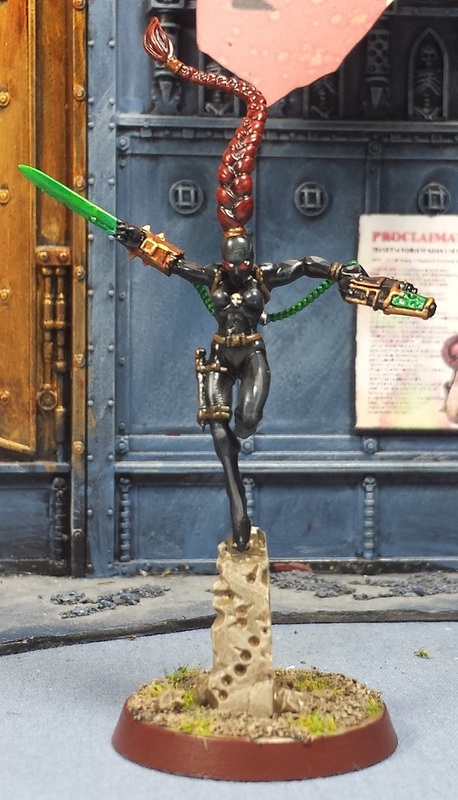 The Vindicare sculpt reminds me of Joe Pineapples from the ABC warriors.... or am I just old. 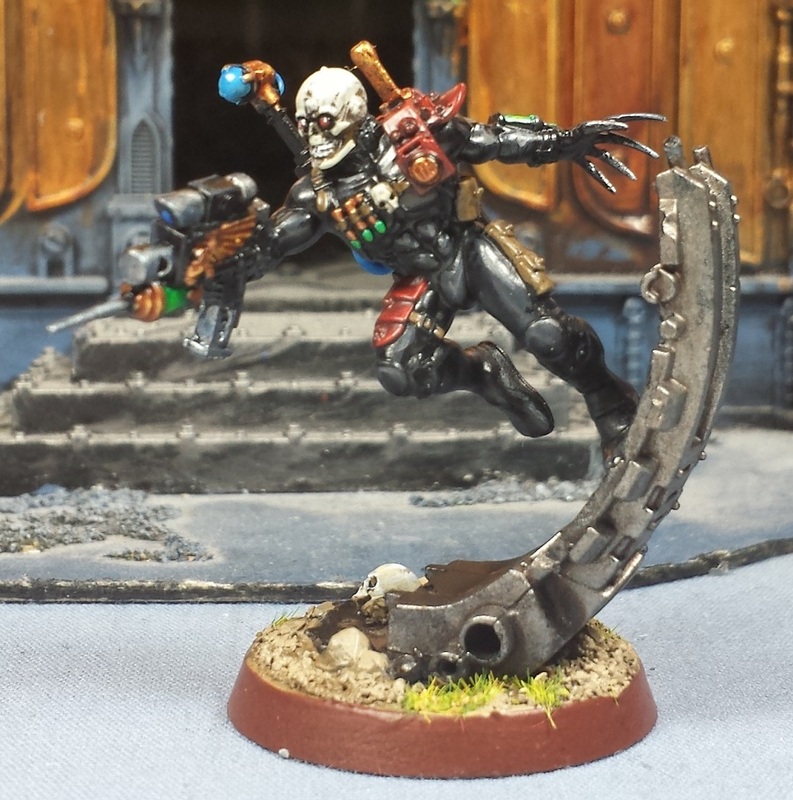 I agree about the Eversor being the most dynamic, though I think personally the Culexus wins the sinister stakes - he has a real menacing stalk about him - very impressive. Haha...while doing my laundry. So impressive! These models look like they'll be infinitely cooler in person, then in photos...much like the solitare model from the harlies. The sense of movement through space really needs to be experienced in three dimensions! Way cool! They really did the old sculpts justice while adding new life into them. Great paint job, the leather under armor is particularly nice. Brilliant work, your paint jobs really do the sculpts justice. That is a very good work of art. Nicely painted. I love the models but think I'll pass on the game. That braid is.... silly to me. But otherwise these do look pretty cool and per usual, your paint jobs bring them to life even more so. Bravo. @#2501: Thanks! Looking forward to seeing yours! @riot ville: Excellent comparison, he sorta does! And if you're old, I definitely am too. Hah! @Greg Hess: Aye, they're way more dynamic in person - the pics don't really do justice to the sculpts. @Pawn Cocktail: Cheers - they were a blast to paint! @John Lambshead: Thanks! The game is not quite what I expected, but seems like it might be amusing. We'll see! @Zzzzzz: Thanks! The sculpts really do exude a sense of menace! I keep going back and forth over the suits on them to be honest. They almost look like wetsuits, that are currently wet but that maybe the shine from the camera. Nice work, and fast as usual! Im still waiting for my box to arrive later today! @Rory Priest: Hah! A little bit of both, was going for a sort of wet look with the grey highlights and a semi-gloss coat. @Arto Ahonen: Thanks very much!